Discover a vacation that has more of those “I’ve always wanted to try that” moments. 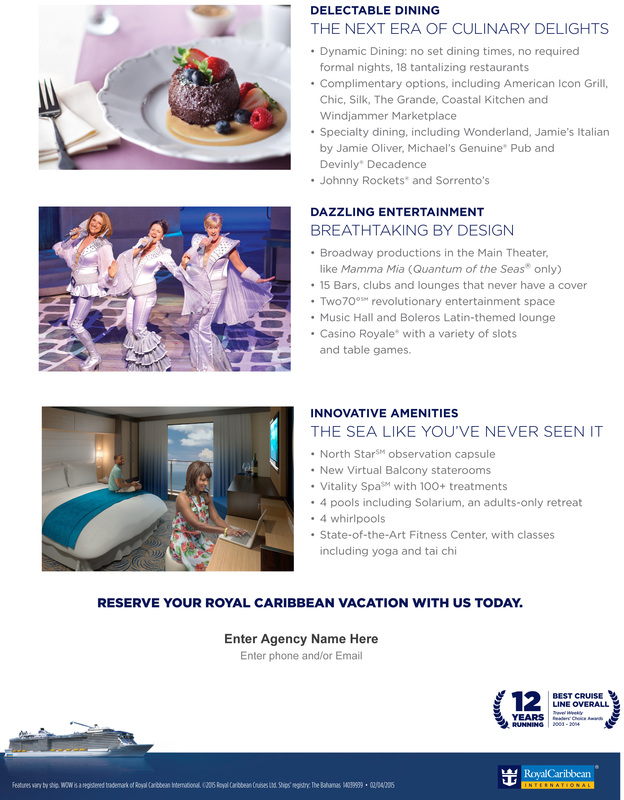 On Royal Caribbean International’s® innovative ships, you’ll find new experiences for all ages and interests. • Together, your family will climb their way to WOW on the Rock Climbing Wall, be dazzled by our ice skaters, hang with Shrek, ride bumper cars, a carousel, play mini-golf, ‘skydive’, and explore destinations from the Caribbean to Europe and far beyond. • Mom and Dad can unwind at the spa, try their luck at Casino Royal (SM), and indulge at specialty restaurants. 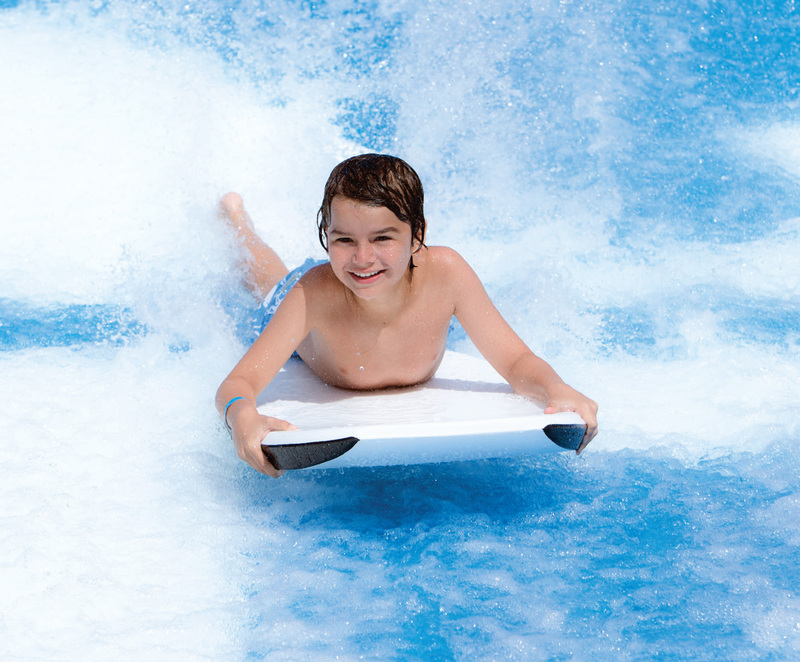 • Kids can embark on the explorations of our complimentary, award-winning Adventure Ocean® Youth Program. • Teens leave that “whatever” attitude behind for pool parties, DJ classes, and hangouts made just for them. Plus TLC for our tiniest cruisers, with Royal Babies and Tots (SM). Royal Caribbean offers a unique dining experience. In addition to the traditional rotational dining found on cruise ships, many ships offer a Dynamic Dining option. You can select your own restaurant and dining times! • The best, most innovative ships, featuring unique experiences that revolutionize cruising. 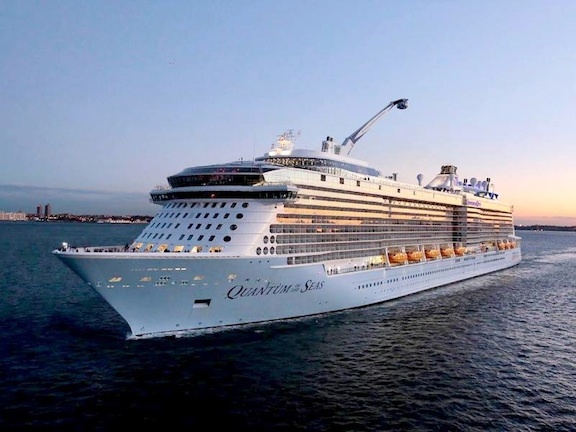 • More than 270 destinations, including private island and beach destinations such as Labadee® and CocoCay®. • Personalized, friendly Gold Anchor Service®. When your family sails with us, you’re in for a vacation you won’t experience anywhere else. Grown-ups, you may be wondering about activities just for you. Don’t worry — we’ve got you covered. *Additional charges apply to spa services, casino gaming, specialty dining and select fi tness classes. Features vary by ship. Besides our live stage productions, enjoy more intimate evening entertainment such as comedy shows, live jazz and piano sing-alongs, plus bars and nightclubs that never feature a cover. Wow your taste buds at specialty restaurants* where each dish impresses with freshness, quality and attention to detail. From the classic American steakhouse to rustic Italian fare from celebrity chef Jamie Oliver, Asian-fusion cuisine and much more, you’re sure to find a sumptuous taste to match your mood. Get your thrills to the sound of cards being shu ed, chips being stacked and slot machines paying out at our Vegas-style casino. From the best equipment to the latest classes, our complimentary fitness center has everything the most sophisticated fi tness clubs have — plus an amazing view. Indulgence begins at our full-service spa, featuring a luxurious lineup of signature treatments, massages, Medi-spa services and salon to make you glow from the inside out.